With 50 years of combined experience in the field of UV lighting, HID Ultraviolet’s engineering team is able to offer a range of features not found in any competition equipment. Our UV floor machines are designed to be the safest on the market, paired with unparalleled durability. Patented Shutterless Instant Start Technology is at the core of how HID’s curing machines operate. Other curing units available require lengthy warm up times, cool down times before the lamp can be restarted and bulky mechanical shutters that can prove unreliable when you need to depend on them most. Our Instant Start curing equipment allows for safety features to be integrated that would otherwise result in costly workflow disruptions, wasting time and money. For instance, if a floor machine is tilted back or held stationary, the lamp must be very quickly shut off for safety. A traditionally driven lamp will now have to cool down to near-room temperature, restart, and then slowly warm back up before it can be used again. With HID Ultraviolet floor curing equipment, just squeeze the trigger, and the lamp will be instantly restarted, and back at full operating power. 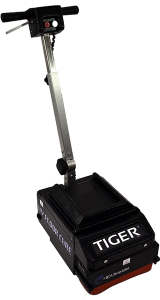 HID’s MAKO series handheld curing units equipment with ultrasonic distance sensors that will shut off the lamp if it is no longer facing a surface. With competitor’s equipment, operators and bystanders can be exposed to dangerous levels of stray UV, as the handheld light cannot be shut off when moving from one area to another. With HID’s handheld equipment, let go of the trigger button, and the lamp will shut off. After moving to a new area, just press the trigger, and the lamp will start, and it’s ready to cure.